Dan Knapp is Executive Director of Publications and Art Director for the USC Dornsife College of Letters, Arts and Sciences, which is in the midst of a capital campaign as part of the Campaign for the University of Southern California. A key element of the campaign was development of The Bridge@USC Brochure, which chronicles USC Dornsife’s place as a leader in cutting-edge research in the area of health. We asked Dan about this Grand Gold-winning brochure. 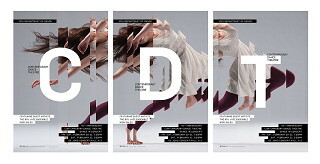 CASE VII: Can you tell us about some of the unique design features used in The Bridge@USC Brochure? DAN: Thank you so much for asking. We’re very proud of this piece. It may sound like a cliché, but this was a true collaborative effort and I really like how the final design turned out. 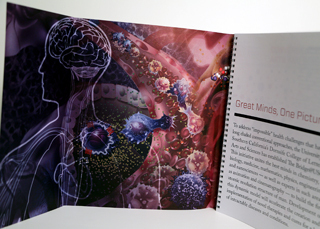 This piece is special because it includes interior gatefolds; dynamic and impactful illustrations mixed with original specialized photography; transparent pages that, when combined, show the internal makeup of the body from molecules, to cells, to organs; a hidden spiral binding (so that the pages turn easily) and a built in pocket so that additional information pages can be customized and added for specific individuals when our advancement team goes out to meet them. We were also adamant that the pages should not appear text heavy, so we took advantage of large, double page images and infographics to convey messages without relying on large blocks of text that invariably “weigh down” any sort of project of this nature. CASE VII: A major challenge many designers face is producing a brochure that is distinctive but still supports a college’s and university’s graphic identity. How did the team at USC accomplish this? DAN: Ha ha. Well, I have to say, when it came to this, we were very fortunate to work in concert with Pentagram (Austin) on the brochure. In 2011, Pentagram refreshed the graphic identity for the entire (USC) university so they were already intimately aware of all the nuances of the university’s – and department’s – graphic identity requirements. As I said earlier, collaboration was a key component to the success of this brochure’s design, and working with a partner who not only understands the perimeters of a graphic identity, but also constructed those perimeters, made things incredibly stress-free for us. CASE VII: In what ways was the brochure used to support the college’s $750 million fundraising campaign? DAN: Obviously, it was an important piece to engage donors in potentially giving to USC Dornsife and the Bridge@USC Institute. But beyond that, it is being used to help attract brilliant scholars to USC and to demonstrate to government and private funding agencies the importance of the work being achieved at USC Dornsife. 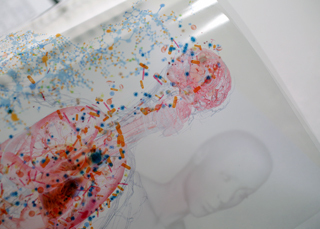 CASE VII: USC Dornsife researchers have discovered some amazing things about the human body. What have you learned that’s impressed you the most? DAN: It’s all so very interesting, but as someone who is living with someone fighting cancer, Peter Kuhn’s research into cancer cells is particularly important to me. Dr. Kuhn is at the forefront of scientific research into identifying the biomarkers of cancer cells and informed treatment decisions. Just this week, Forbes highlighted a partnership between his team and other educational institutions and biomedical research companies to develop cancer blood tests as part of Vice President Joe Biden's Cancer Moonshot. According to Dr. Kuhn, this partnership will allow researchers to build a database of information in five years rather than 10. CASE VII: The 2017 CASE Awards of Excellence are just around the corner. What advice would you give those preparing entries? DAN: I definitely think entrants need to take the write-up portion of their entry seriously and answer the questions accurately and concisely. I have been a CASE judge at the national level for several years, and I know we look to those write-ups to answer questions and help select one stellar entry over another. I also think entrants need to be realistic in what they submit. If someone enters something that looks like 50 other entries, then the likelihood of being recognized is not very high. While my job is not necessarily to collect awards, I go into every project with the CASE competition in the back of my mind, asking myself what I can do to make projects special, unique or different than similar type items we’ve all seen a thousand times before. And, also, remember that the judges see dozens of entries and that awards are given on how certain criteria are met, but at the end of the day, it is subjective as well. Just because someone else wins the award is not a reflection on your hard work…it’s simply that the winning piece(s) resonated with the judges in some way. 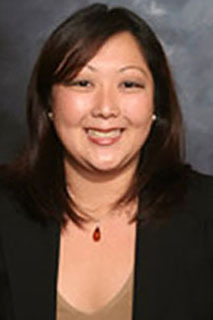 Sherry L. K. Main is Associate Vice Chancellor, Communications & Marketing, for the University of California Santa Cruz. 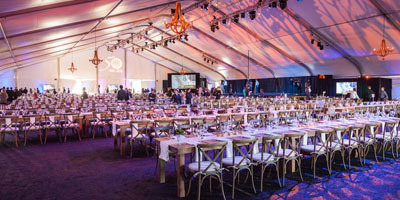 In 2015, the university celebrated its 50th anniversary by hosting a dinner for 1,000 donors and community members. Sherry was part of a team that was tasked with ensuring the event lived up to high expectations. As one of only six 2016 Grand Gold winners, we thought it worth asking Sherry how they pulled it off. CASE VII: When did planning for the Fiat Fifty: 2015 Founders Dinner begin? SHERRY: FiatFifty as a concept was first thought of in the larger context of planning for UC Santa Cruz’s 50th anniversary celebration in 2014. The event planning itself began eight months ahead of time in January of 2015. It really began to take shape around April when we had confirmed our University Medal recipient Alice Waters, emcee Kathryn Sullivan ’77 (National Oceanic and Atmospheric Administration administrator and former astronaut), and Tandy Beal & Company as our entertainment for the evening. CASE VII: Was there universal buy-in from the start? SHERRY: There was universal buy-in from the start that the 50th anniversary of the campus founding was something special and a year not to go by without spectacular celebration. 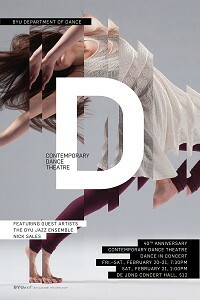 The image for the spectacular event, however, took some months to evolve. What was certain and ingrained in our process was that this was an opportunity to recognize the founding faculty, staff, and alumni who were critical to setting the foundation of our university. Since we had many living founders around, we wanted to be sure they felt appreciation from our campus community today. Our annual Founders Dinner is billed as an awards and fundraising gala. Given the special anniversary, we decided to increase the attendance and bring this annual event back onto campus (usually held at a large venue in town). It was a great way to get our best donors out to support the campus, as well as cultivate new donors with the “wow” factor of the event. 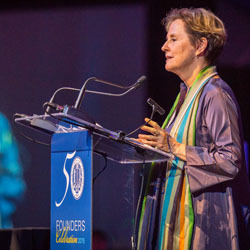 Having culinary leader Alice Waters in attendance as our medal recipient really aligned with the organic food movement and social justice aspect which UC Santa Cruz has come to be known for. CASE VII: How did the event fit into the UC Santa Cruz campaign strategy? SHERRY: UC Santa Cruz is engaged in its first comprehensive campaign, and this event was a signature piece of the effort. We made sure that the campaign initiatives were threaded throughout the communications pieces, the event itself, and follow-up. All gifts made this evening counted toward the campaign. Our donor relations team also received checks in hand this evening. FiatFifty also served as a pivot point for our 50th anniversary celebration, where we began to look forward to what the next 50 years at UC Santa Cruz should look like. The campaign initiatives really helped to illustrate that narrative. The momentum from Fiat Fifty gained us media coverage, as well as community awareness for UC Santa Cruz’s excellence in research and teaching. CASE VII: What were you biggest challenges/concerns? SHERRY: In all honesty, our biggest challenge was in how we could take all of our grand ideas and package it into an evening that was not business as usual, but also didn’t make us look like we were going over the top. Budget and student fees continue to be difficult conversations, especially as a public institution. Fortunately, through a lot of hard work, gifts in kind, relationships that we had built up over the years, and intense collaboration across campus partners really made this event affordable and spectacular. Chef Alice Waters inspired our menu. To take her food design, use campus and locally grown produce, and serve 750 people out of a makeshift kitchen on a field, was a feat to say the least. Being a foodie myself, I knew that a lot of people who attended this night were looking forward to Ms. Waters’s menu, so the bar was set high from the beginning to be sure the food, the experience, and the ambience was top notch. CASE VII: Did the event live up to expectations? SHERRY: The event was beyond what we could have expected. Once the guests of honor arrived – our founding faculty, staff, and alumni – the party kicked right into full force. Guests were reminiscing about the original days on campus and reflecting how much the campus had changed over five decades. 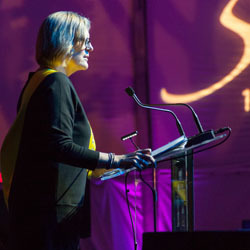 Our chancellor, Sammy the Slug (mascot), and emcee Kathryn Sullivan engaged our guests throughout the cocktail hour, which made the 750-person event feel very intimate and personal. Emcee Kathryn Sullivan engaged guests. The walkabout performers, on-stage acts, after-party dancing, and star-gazing with our graduate students really made for a night to remember that guests still reflect on some months later. What I feel really hit home with folks is that we really do shine in many disciplines, which we were able to successfully showcase throughout the evening – from organic farming to astronomy, and to careers that have not been imagined yet. CASE VII: If you had to do it all over again…? SHERRY: I would do it in a heartbeat! As challenging as some of the planning may have been, having the benefit of hindsight would certainly help to make it easier. The team that you have is critical, as is the leadership and commitment from the top. I feel that the chair of our event committee did an excellent job keeping us on task, and that everyone – from the writers to the event assistants – rose to the occasion. The team really made the evening one that was worth the incredible effort! 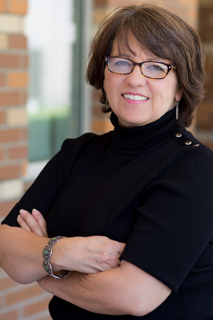 Dawn Bonker is a Public Relations Writer for Chapman University, winner of a Grand Gold from the CASE VII 2016 Awards of Excellence in the Digital Communications category. CU was recognized for its extraordinary work to expand CU’s visibility through its Happenings blog. Since only six Grand Golds were awarded out of 500 entries, we thought it worth checking in with Dawn to learn a little more about what Chapman has been doing so well. CASE VII: A lot of blogs get started with the idea that “If you build it, they will come,” but that’s not necessarily the case. What does Chapman do to grow its Web presence through its Happenings blog? Dawn: We are believers in the philosophy that “content is king.” Like the editors of any publication or blog, we are aware that readers’ time is at a premium. So we work hard to write high-quality stories with original reporting, interviews and photography that showcase university news in a readable and engaging style. I’m the main writer for Happenings, but each member of the communications team contributes to the blog, and all have an extensive writing or journalism background, so that’s been key. Many of the stories that first appear in Happenings are repurposed for Chapman Magazine, too. CASE VII: Chapman also aims to showcase its faculty by encouraging them to share their accomplishments on the Faculty Notes section of Happenings. Faculty can be difficult to reach, how do you get them to participate? Dawn: We employ a fair amount of old-fashioned relationship-building – and no small amount of badgering, truth be told! I remind faculty and departmental assistants to send us their news via our new online submission form, but I always add that a quick email is fine, too. But use of the submission form is growing. When I see a story idea in a Faculty Note submission, I mention that to the faculty member when I call – “Hey, saw this in Faculty Notes. Great story, can we talk more?” That kind of thing. We also built the form to invite other faculty news, like talks given at the Rotary Club or local library. We’re starting to see which faculty are out in the community, which is good information for us as we enhance our local neighborhood relations. CASE VII: You rely heavily on metrics to promote stories and video with higher “social scores.” Can you tell us exactly how that works? Dawn: Our web team has created an algorithm that gives blog posts “social scores” based on engagement, including social shares, comments, and reads. 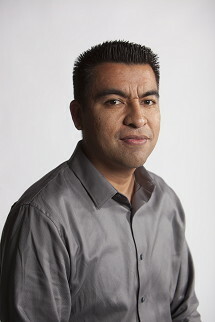 The social media team at Chapman dips into blog content to promote news on Facebook and Twitter. All stories within the university’s blog system – which includes several departmental and college blogs – are considered by our web team for promotion. Those blog posts with the highest social scores rise to the top of our web page, inside.chapman.edu. By watching social metrics, we know what kind of content is generally most popular: Alumni-based and topical news content featuring faculty expertise. We plan Happenings content with that in mind. We meet regularly with our web team and home page content planners to make sure we’re delivering the type of content they need to advance the university’s messaging. It’s somewhat similar to a news planning meeting at a newspaper. Not all stories are green-lighted, while others might be planned as shorter announcements. CASE VII: Of all the positive results you’ve seen, what’s been most rewarding? Dawn: Our web designers have created a wonderful home page where these stories are beautifully displayed, and I think the combination of good content and killer design can’t be beat. It’s a great way to share the amazing stories about our students, alumni and faculty who are doing important, creative and interesting things in the world. CASE VII: What’s next for Happenings? Dawn: Our graduating classes have grown in the past 10 years, so we have many alumni who are starting to hit their stride in their fields. We are writing many more alumni stories and profiles. CASE VII: Has life changed for you since you won the CASE VII Grand Gold? Does the air smell sweeter? Dawn: What’s that? I couldn’t quite hear you over all these bluebirds of happiness twittering around here. Yes, our whole team is pretty pleased with the Grand Gold!